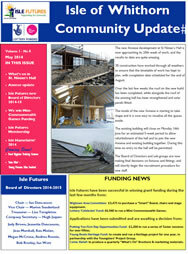 At long last, we are now officially under way with the Isle’s Annexe build project. Last week, 3b construction began preparing the site, erecting security fences, installing storage containers, and getting earthmoving equipment ready, so that there would be a flying start for today, the first official day of building works. They didn’t waste any time either – by 10am the public toilets had been reduced to a pile of rubble, and by lunchtime hardly a trace of that remained. (Don’t worry folks, there’s one of those blue tardis thingys outside the Hall to help anyone in need, and until the Annexe opens with its own brand new loos). 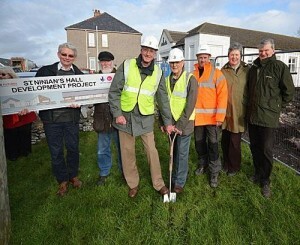 To mark the occasion, two ‘senior’ Isle of Whithorn residents, Ron Bramley and Billy Brown, both long-standing volunteers in the community, helped launch the Isle Futures’ project by lifting the first turf sod. Cheered on by a large group of villagers, and accompanied by Robert Marr of 3b construction, this was the start of a seven-month building project that will bring a new building equipped with tea room and shop, as well as a visitor reception facility, and which will augment the existing award-winning Hall.